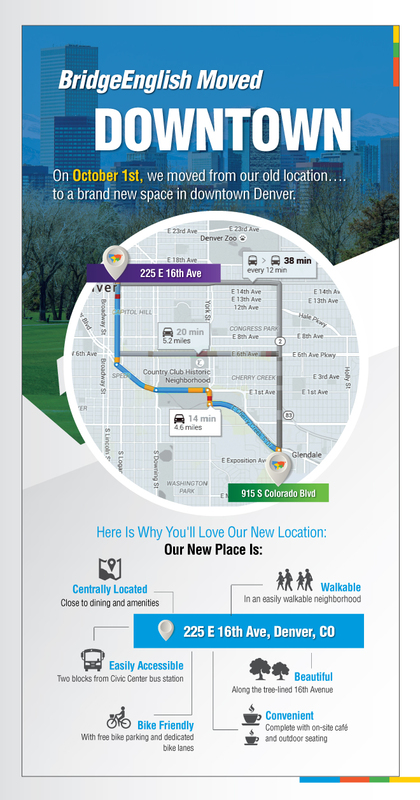 BridgeEnglish Denver is Now Downtown! Since 1986, BridgeEnglish Denver has been serving thousands of international students at our learning center on South Colorado Boulevard. Over the years, we have grown significantly in this space and have evolved to be at the forefront of the international education industry. To continue to improve our services and to offer more opportunities to our students, we have made the big decision to move to a new location in downtown Denver! Our new location in the Denver city center is just few blocks from the Colorado State Capitol, Denver Public Library and Denver Art Museum, with easy access to restaurants, public transportation and a wealth of other amenities. The new location is freshly remodeled and boasts state-of-the art classroom technology to make life for our students better than ever. We are excited to better serve out students in this location, and moved on October 1, 2015. We have been working very hard to make this transition seamless for our current students, and will be fully operational during the moving process. We look forward to seeing everyone at our new address, 225 E. 16th Ave, Suite 120, Denver CO 80203! Blog Post written by Nancy Choi, Bridge Marketing Intern. Updated by Lauren Bell. esl-blog Bridge Colorado Boulevard, BridgeEnglish Denver, Downtown Denver, English language school, English language school in Denver, ESL, ESL school downtown Denver. permalink.